Whether it’s for the holidays or the rest of the year, a table runner is a great way to add personality to a plain table setting. A little less commitment than a full tablecloth, a runner takes up less room, usually doesn't need to be ironed, and most likely won't get spilled on since it's going down the middle of the table. So there are definitely advantages! Plus, they allow you to show off the actual table and they look amazing underneath a centerpiece. If you're not finding a version you like at the store, just invest in an affordable plain colored one and you can give it an easy upgrade. Here's how to do it! Before you pick up your paintbrush, take a minute and decide what you want to create on your runner. You can do confetti-like dots, you can do stripes, or you can even do a more intricate stencil if you're feeling ambitious. We wanted to keep things relatively simple so that our runner would be versatile for occasions plus everyday use. 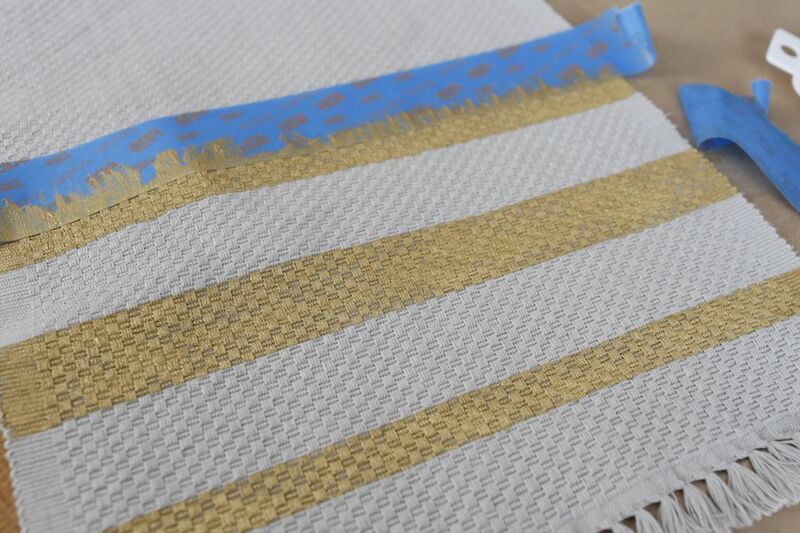 We opted for gold metallic stripes at the end of each side of the runner. Gold paint is the perfect choice to be able to use this runner at Thanksgiving and Christmas (not to mention the rest of the year). Using the width of the painter's tape to space out the stripes, place and secure the painter's tape to the surface of the runner. Try varying the size of the stripes for added interest. We did a thick stripe in the middle and thinner ones on the top and bottom. If you're worried about the tape not performing, you'll be amazed at how clean a line you'll be able to produce using this technique. To form the best possible seal on any edge that will be exposed to paint, run your thumb over the edge of the tape to make sure it's secure. Apply a liberal amount of paint using your foam brush. Because you're painting on fabric, don't brush the paint on the way you normally would with paper or wood. Dab to cover the area where you want your stripes to be; you'll end up using more paint than you think you'll need. Keep going until all of your stripes are completely covered. Once you're satisfied with the paint application, remove the painter's tape. Pull it off toward you and at an angle for the most precise line. Let the paint stripes dry completely before you use the runner for the first time. Enjoy! 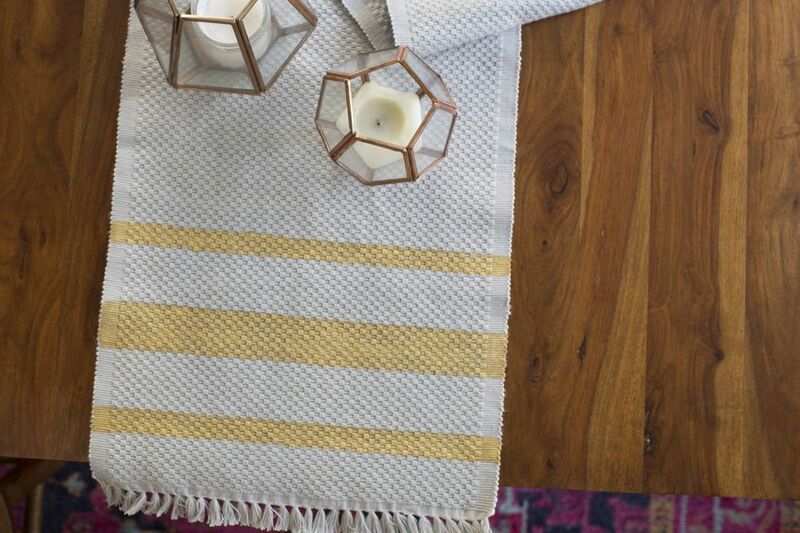 You'll get plenty of use out of this subtly decorated table runner.